Recently I wrote up a piece about quantifying memory and news, and proposed that two distinct linear models might be the way to go about it. However, the problem with linear models is they by their nature don’t take into account the ways in which trends may be non-linear.They also lead to nonsense predictions, such as negative values. 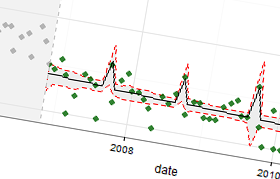 Generally, then, linear models should be avoided when mapping count data. What are the alternatives? Typically, a Poisson distribution would be ideal way to capture the probability of a clustering of observations being non-random. A feature of the Poisson distribution is that it assumes the sample mean equals the sample variance; this is very frequently violated when dealing with news data, as a story will have a small number of large values, followed by a large number of small values, resulting in a low mean and a high variance. Instead a negative binomial distribution may be used, which takes a value theta specifying the degree to which the variance and mean are unequal. Estimates provided by a negative binomial model are the same as Poisson estimates, but probability values tend to be more conservative. The above results may be considered in ANOVA to identify which variables contribute significantly to the model. Details about the coding of the variables, and the logic behind models contrasting stories as news or memory events may be found here. From the negative binomial model predictions and confidence intervals for the period identified as of potential memory significance may be created. The 95% confidence interval either side of the predicted value is calculated by multiplying the standard error by 1.96. I want to plot the whole data, but only predicted values for the period identified as significant, so next I removed predictions for the data up until the period with memory potential. Finally I created a data frame containing the interval for which no estimates were calculated (this will be used to blur out data in ggplot). Notice in the above table how the anniversaries variables exceed the explanatory power of the news and date variables. This indicates that by the end of 2006 Beslan was increasingly featuring as a memory event and less as a news story. Also notice how the remaining deviance is quite large – this model apparently fits the data less well than the model for the entire data (it explained 85% of the deviance), but this is due to the original estimate being biased by the accurate prediction of a few outliers. To leave a comment for the author, please follow the link and comment on their blog: Quantifying Memory.